This post will focus on the different methodologies available in NSX for dealing with BUM traffic. That is Broadcast, Unknown Unicast and Multicast traffic. This encompasses all traffic that doesn’t have a specific layer three address. In all three of these cases, the traffic is destined to touch anything up to all physical hosts in the cluster, and NSX has a few different ways of handling that traffic. Before we get started though, it would be useful to discus VTEP Segments. Following the VMware best practice design guide, our VMware system will be split into multiple clusters, with Management and Edge clusters (sometimes consolidated) and probably multiple compute clusters. This makes for ease of management, and reduced failure domains. It is common to design in a 1 cluster per rack pattern, so that the rack unit becomes a module of capacity. Each rack is then created with unique IP information, so that addition (or removal) of a rack doesn’t affect IP ranges, and so that equal cost multipathing (ECMP) can be used to form resilient connections to a Leaf-Spine network. Of all of that, we are concerned with just one thing. Each rack will be on a different IP subnet. These subnets are referred to as VTEP Segments. The VTEP Segment a host is connected to, is the IP subnet of it’s VXLAN interfaces. Multicast has the most restrictive hardware requirements, but is the easiest conceptually to grasp. The earlier posts in the series assumed Unicast, which is only available on the vSphere implementation of NSX and is the most complex, but also the most flexible. The replication mode is set at the Transport Zone layer. It *can* be over-ridden at the Virtual Switch layer, but I can’t see any reason why you would want to do this on a case by case basis. KISS! Multicast replication mode depends on the underlay switch configuration to support a full Multicast implementation. 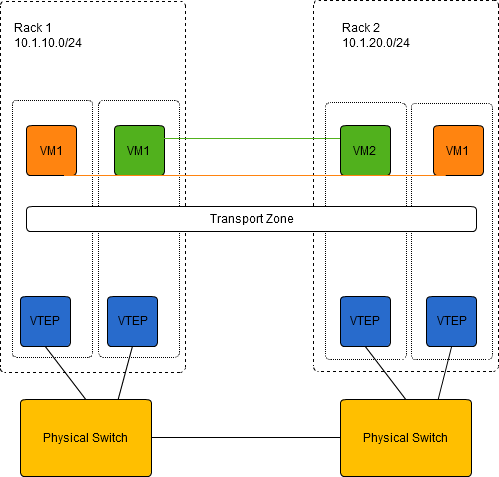 The VTEP(s) on each host, join a Multicast group on the physical switch for each Logical Switch that is created, so any BUM traffic can be directed to the Multicast group, and is distributed to all VTEPs in the group. This has the advantage that BUM traffic is only distributed to hosts that participate in a given Logical Switch. Support for IGMP, PIM and layer 3 Multicast routing are required at the hardware layer. This is a notoriously complex area of network design and maintenance that many wish to avoid. The system is most deeply tied to the hardware layer. With many Logical Switches, you need many Multicast groups which could become a limitation in a large environment. Unicast replication mode is the exact opposite of Multicast mode. With unicast mode, when a BUM frame is received by a VTEP, it sends the frame directly to each other host in it’s own VXLAN Segment. It then picks a host in each other VXLAN Segment that is designated the “UTEP” or “Unicast Tunnel End Point”. When this host receives the frame, it sends it to each other host in the segment. Again, the calculation of “each other host” and “each other segment” takes into account logical switch location, so if a logical switch is not active on a host, or segment, it will not receive the frame. This has the positive side that the underlying hardware capability is completely ignored. It is a pure software solution that decouples us from the underlying hardware. The major downside is that in the case of many segments, many packets may be sent from a single server rather than just one in the Multicast mode. This can eat bandwidth in high density cases. Hybrid is exactly what it says on the tin. Layer 2 Multicast, IGMP is used within VXLAN segments to reduce the number of packets sent from a host. Unicast is used between segments in order to avoid the need for layer 3 Multicast and PIMs. This is a good halfway house between the deep hardware reliance of pure Multicast, and the performance issues of unicast. This probably scales the best of all of the systems, but has the downside of needing IGMP from managed switches within each cluster. With Hybrid mode, the “VTEP” that is called a “UTEP” in unicast is now called a “MTEP” (Multicast tunnel endpoint) because it pushes out Multicast packets.